Meg's Food! 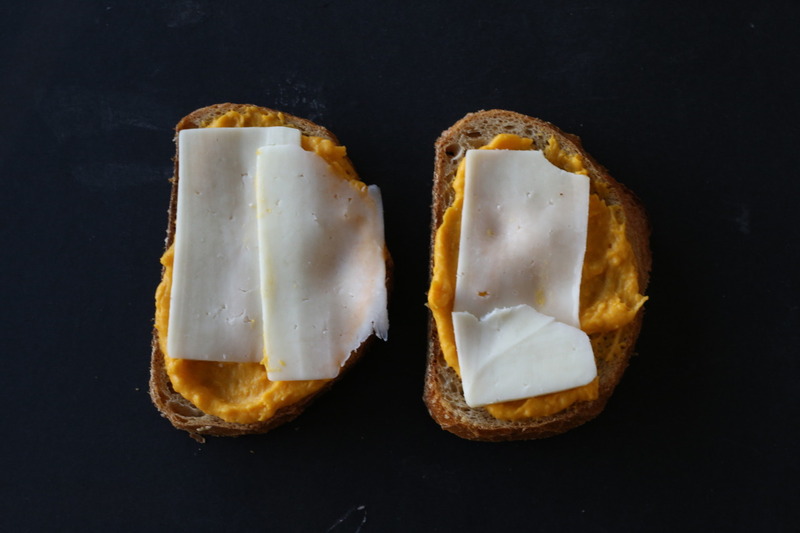 | Butternut Squash Grilled Cheese - Meg's Food! Some days just call for grilled cheese. Long, cold, dark fall nights especially. I love a good old fashioned grilled cheese, but I also like to make mine a little more interesting. After Christmas I love eating grilled cheese with cranberry apple jam, because it’s so perfect for late December. This version is all about fall. Creamy butternut squash sauce is your friend here, the kind that also goes well with zucchini fettuccine. Top your favourite bread (I used a crunchy sourdough) with the dreamy sauce, a nice melty cheese (I used goats milk mozzarella, so perfect for this) and some greens, and you’ve got yourself fall’s favourite grilled cheese. It’s creamy, flavourful, and so so cheesy. I may need to eat this every night. First, make your sauce (you’ll have lots of leftover sauce – you can use it on pasta, zucchini pasta, or even freeze it). Preheat oven to 375, line a baking sheet with parchment paper, and toss squash cubes with olive oil. Season with salt and pepper and roast until tender, 40-45 minutes, tossing halfway through. 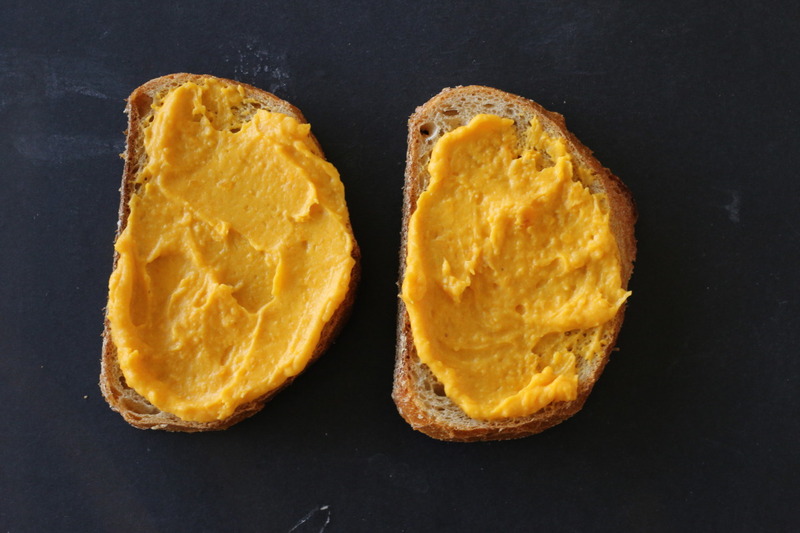 In a food processor, blend squash with coconut milk and red pepper flakes. Spread 1-2 tbsp of sauce on each slice of bread. 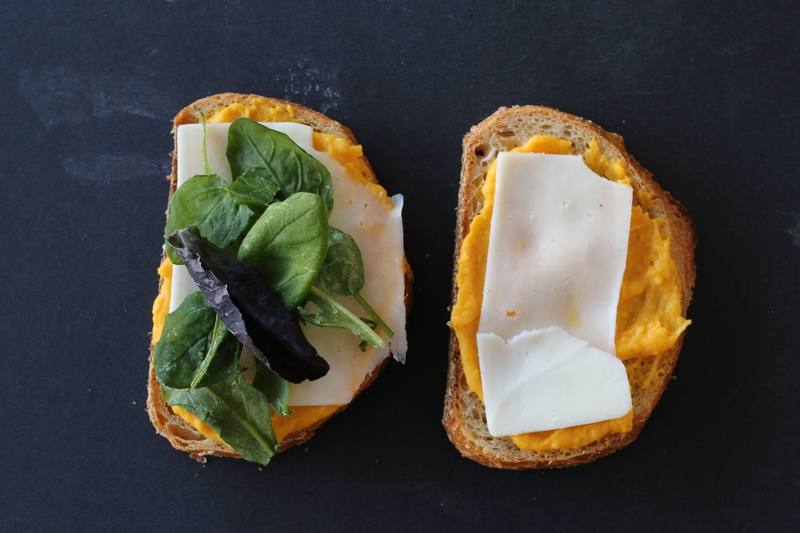 Top with sliced cheese and greens, and sandwich together. Melt butter in a small saucepan over medium heat. Add sandwich and cook until one side is golden. Flip, and cook until other side is golden. Serve immediately, and rejoice in fall flavoured comfort food! 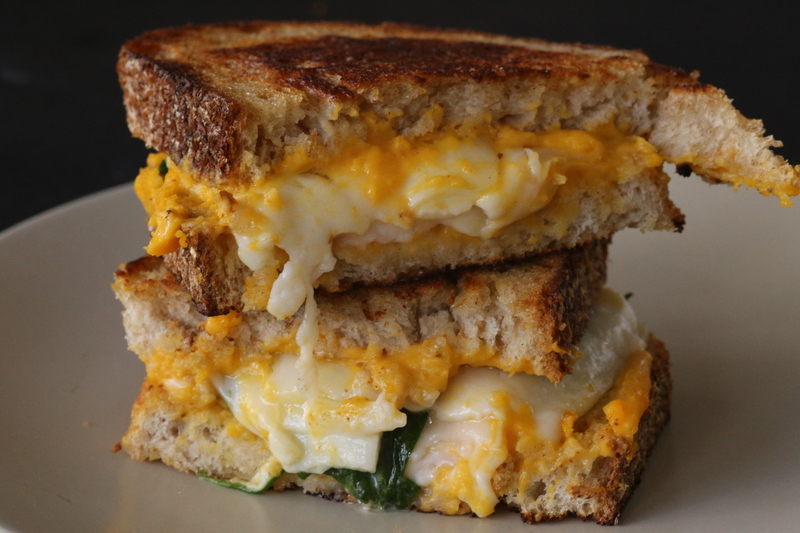 This entry was posted in Lunch, Recipes and tagged comfort food, grilled cheese, sandwich, spinach, squash. Bookmark the permalink.